Second Sunday of each month(steam train rides) 10:00am - 4:00pm. 4th Sunday of each month (diesel train rides) 10.00am - 4.00 pm. And most Public Holidays. Other times by appointment. Groups very welcome Phone 0427 509 988 for information. This collection is located an old railway station, which now operates as the Alexander Timber Tramway and Museum. Key items include an impressive collection of 2 foot narrow gauge steam, diesel and petrol locomotives and assorted rolling stock (including industrial rolling stock), together with a large range of local and regional historical artefacts and machinery from the early logging period (1900-1950) in the Rubicon Forest. The collection reflect the forest’s long history of logging from1907, when Clark & Kidd built the first sawmill in the area and constructed a 3 foot 4½ inch (1029mm) gauge wooden-railed tramway out of the forest and down to the river flats below. 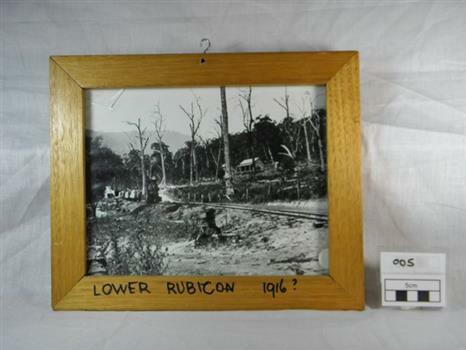 In 1912, the Rubicon Lumber and Tramway Company completed a 2 foot (610mm) gauge steel-railed line connected the forest tramway with the railway station in Alexandra. This line operated with three small (6-tonne) Krauss 0-4-0WE locomotives. In 1935 ownership of the line transferred to the Shire and later acquired by Clark & Pearce, who operated it with a 10 tonne diesel locomotive from Kelly & Lewis of Springvale (and a second identical unit from 1936). The terrible bushfires of 1939 destroyed seven of the eight Rubicon forest sawmills and killed twelve men from the timber industry. Although the mills were rebuilt, transport by road was a more practical option and the line closed in 1947. The last of the Clark & Pearce sawmills closed in 1954. The collection documents aspects of Victoria’s timber industry from 1900-1950, with a special focus on the narrow-gauge railway system supporting the industry. It also documents local history of the Alexandra district. Pair of pink woollen machine knitted patterned mittens. Cord draw string in wrist of same material. Thumb separate to fingers. Frill to wrist. White silk handkerchief with a 1.5 cm drawn thread hem. In one corner is embroidered Souvenir de France in brown colour. The rest of the embroidery include two flagpoles, one with France's flag, one with a British flag. There is a red rose of France at the bottom of the flagpole scattered green leaves throughtout the embroidery. The embroidery takes up a quarter of the whole hankerchief. During the 1914-1918 war these souvenirs were sent by a soldier to his sweetheart, his fiancee. The handkerchiefs are made of pure silk. Sadly the soldier was killed on the battlefield and did not return home. His fiancee remained true to his love for the rest ofher life, laughing away the proposals of any other admirers. Her name was Ada. She is 97 years of age and now lives in Tasmania and was once a friend of Beannie Cummins (dec) of Alexandra. This Handkerchief purse was once used by ladies to store their beautiful handkerchiefs. It is made of white silk (now faded. )Padded with cotton padding front and back. It has an embroidered cord around the outside with bows of cord on four corners and in the middle and top, and across the top of the opening of the purse. It has an embroidered panel 13cm x 8 cm with bows of ribbon on the two bottom corners, lace and cord around the panel. Panel embroidered with British and French flag in their country's colours in the shapes of 1919. SOUVENIR DE FRANCE embroidered in panel in green faded silk. During the 1914-1918 war these souvenirs were sent by a soldier to his sweetheart, his fiancee. The pocket handkerchief holder was made of pure silk. Sadly the soldier was killed on the battlefield. His fiancee remained true to his love for the rest of her life laughing away other proposals of many admirers. Her name was Ada. She is 97 year old and now living in Tasmania and was once a close friend of Beannie Cummins (dec) of Alexandra. This information was given in 1994. Part of our World War One collection. White Silk Handkerchief with cotton lace edging os 1.5 cm wide. Monogram on corner in the shape of a horseshoe. Embroidered in red silk with the words "SOUVENIR DE FRANCE". In the middle of the horseshoe there is an embroidered bunch of flowers in the colours of France, red, white and blue. There is a gold border around the horseshoe. During the 1914-1918 war these souvenirs were sent by a soldier to his sweetheart, his fiance. The handkerchief is made of pure silk. Sadly the soldier was killed on the battlefield and did not return home. His fiance remained true to his love for the rest of her life, laughing away proposals of any other admirers. Her name was Ada. She is 97 years now and is living in Tasmania, was a good friend Beannie Cummins (dec) of Alexandra. Information forwarded in 1994. Part of our World War One collection of local significance. Wooden framed black and white photograph of a two foot gauge steel rail line from the mill sight to Alexandra. This locomotive, a Kraus, steam engine (year ? )is passing through Lower Rubicon. It hauls three carriages with timber and on the side of the rail there are open boxes. A wooden house on Gilmore's family property is halfway up the hill. The property shows signs of damage of the recent Goulburn River flooding in 1916. There is a hook in the top of the frame and writing on the bottom of the frame "Lower Rubicon 1916". On bottom of the frame "Lower Rubicon 1916?" written with black texta colour pen in capital letters.